The 1969 Dodge Charger is easily distinguished from the 1968 model by the insert of a vertical bar in the middle of the grill and the use of rectangular tailights instead of the round ones used on the 1968 model. Otherwise, the 1969 model is virtually identical to the 1968 model. 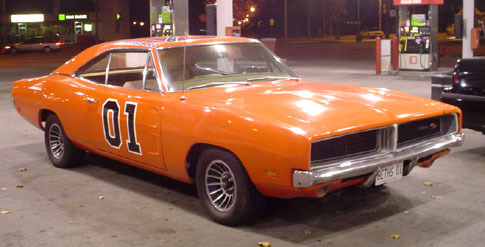 The 1969 Dodge Charger is likely most famous as the "General Lee" as pictured above. R/T: 375 hp 440 Magnum was standard. Heavy duty drum brakes, special handling equipment, F70 Red Streak Tires. Available 1968-1971. Hemi and 6 pack were options as available. SE: Leather seats, wood grain whell, deep dish wheel covers, wood grain instrument panel. Could be ordered with R/T package. Available 1969up. Charger 500: Flush mounted coronet grill, new full back window to lower drag on raceways. Hemi was standard motor in 1969. Available 1969/1970. Designed for NASCAR use.